A meal soup is a firm, creamy soup that is eaten in between meals or as an evening meal. The soup is thick and filled with meat, fish, pasta or rice, some potatoes and, of course, lots of vegetables. A regular soup becomes a meal soup if you add extra meat or fish, pulses and/or rice, pasta or potatoes. A meal soup is approx. 500 ml per person – slightly less if there is much “filling” for example in bouillabaisse. For an ordinary soup 200ml to 250ml per person will do. What are the health benefits of meal soups? Meal soups mainly consist of water and vegetables and therefore they deserve a standard place in the food triangle. One portion 250ml portion of soup accounts for one sixth of your daily intake of liquid and almost two portions of vegetables 150g. Having a meal soup as a snack prevents eating sweets in between meals. They are even tastier if you prepare them a day ahead as the flavours can develop much better then, just like stews. Vegetable soup contains few calories, saturates and cholesterol. One 250ml portion of vegetable soup only contains 65 calories. 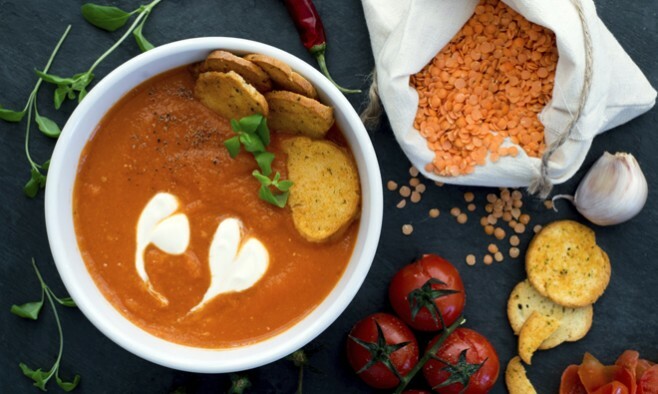 Meal soups contain essential nutrients, like vitamins, minerals, anti-oxidants and fibres: indispensable advantages for a balanced nutrition. A fish soup should not be heated again to avoid disintegration of the fish pieces. A creamy soup should not be boiled for a second time to avoid curdling. You can add an Asian or Mediterranean touch by using the right herbs or spices. Taste boosters used in Asian cuisine are curry powders and curry pastes, lemon grass, coriander and soy sauce. In southern-Europe garlic and herbs such as fennel, oregano and rosemary are used. Next to that fish is also an important “filler” component. If you want a north-African soup choose chickpeas, lentils, coriander, flat-leaf parsley, harissa (a hot, red Tunisian spice), and cumin as taste boosters.